Direct from the mixing desk of Playground Recording Studio: This is a direct transfer from the original studio reels of one of Jimmy’s first studio visits in Valapraiso, Florida in June 1972. Here you will get the collectors dream of false starts, count ins and alternate takes of the legendary recordings of “Blue Moon of Kentucky” and “That’s All Right”. Also the raw mix as they were recorded! These were recorded at Playground Recording Stduio by Finley Duncan and then leased to Shelby Singleton – which almost got sued by RCA for releasing unreleased Elvis material. I bought these ten years ago and they were quite expensive at the time. Offered here at a much lower price. They have been in my collection ever since. 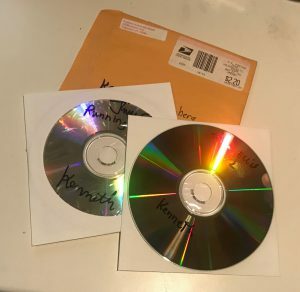 They were delivered on CD-R and they are still in the original package which will follow the CD’s.CD 2 mostly contains small clips from the transfer and mixing, but very cool to hear.